Niagara Falls, N.Y. (Jan. 30, 2017) - Calling all area food vendors, Old Falls Street, USA, the three-block entertainment district that connects Niagara Falls State Park with hotels and attractions in downtown Niagara Falls, NY, is calling for local vendors who are interested in selling their products during the 2017 summer season (Memorial Day through Labor Day). Applications will be accepted on a rolling basis throughout the year and may be obtained by emailing FallsStreet@gmail.com. "This year, we are calling for local food vendors who serve fresh and healthy meals on a daily basis," said Spectra Venue Management&apos;s Jason Murgia, general manager, who stressed that menus should appear to both local and regional families with children as well as an international audience. "We want to showcase the very best Niagara regional offerings to the thousands of local, national and international guests visiting Old Falls Street, USA." 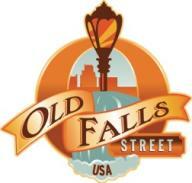 Serving as the Niagara Falls "Community Welcome Center," Old Falls Street is managed by Spectra Venue Management. The dynamic thoroughfare attracts a variety of residents and out-of-town visitors while providing exciting spaces for seasonal food vending, daily interactive games, festivals, concerts and other free family-friendly activities throughout the year. Old Falls Street hosts daily interactive games, the Flicks on Old Falls free outdoor movie series, a Friday evening concert series and Free Family Fun activities on Saturday afternoons during the summer, as well as a host of other special events and activities throughout the year. To obtain an application, send an email to fallsstreet@gmail.com. After completing the application, it can be returned to the same email address. Once the completed forms are reviewed, a member of the Old Falls Street team will be in contact to discuss the application. About OLD FALLS STREET, USA: Old Falls Street, USA, managed by Spectra by Comcast Spectacor, is a historic three-block destination that conveniently connects the entrance of Niagara Falls State Park with the Conference & Event Center, the Seneca Niagara Resort & Casino and other Downtown Niagara Falls, NY attractions. Serving as the "Welcome Center" for residents and visitors alike, the dynamic thoroughfare provides spaces for seasonal daily vending and free interactive games, special activities including concerts, festivals and holiday activities. Additional information can be found at www.FallsStreet.com.